Despite that I have to say the one food I could probably eat every single day is battered and fried eggplant, otherwise known as eggplant fritters. They are a yummy and satisfying alternative to chips or French fries and can be pretty cost effective. And for the most part they are pretty simple to make. If you have had eggplant parmesan, you have had an eggplant fritter, you just had sauce all over it. 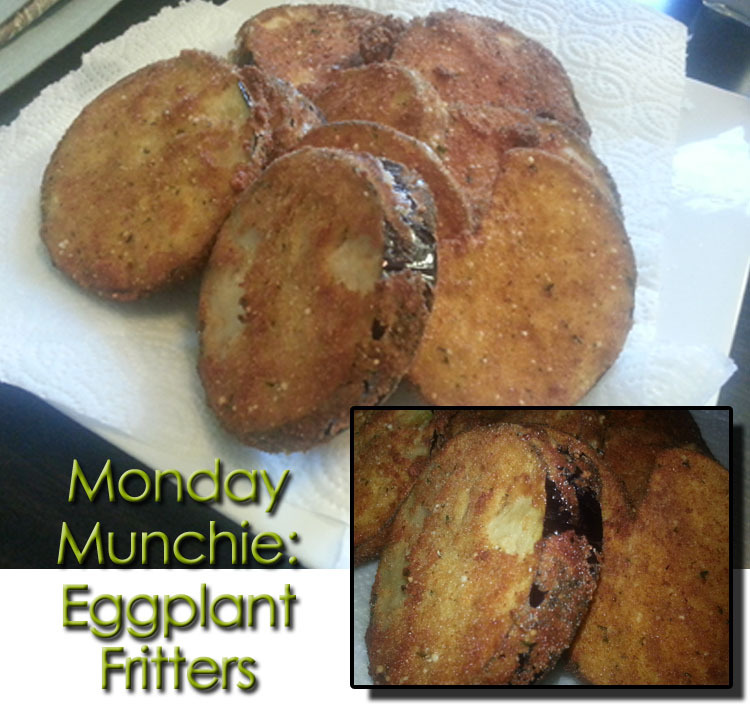 In the future, I will share a killer sauce recipe as well as an awesome eggplant parmesan recipe that these fritters can go into to tease and delight your taste buds with, but for now, I hope you enjoy these little delectables. Personally, they are my kind of finger food. Start by slicing your eggplant into 1/4 inch slices. I like to cut the eggplant so the slices are round but you can also cut them on the diagonal or into strips. Next, sprinkle the slices with sea salt and let rest for about 30 minutes to one hour. This pulls out the water from the eggplant and makes them not only tastier but easier to fry. Next, prepare your batter and pre-batter items. First, scrambled your raw eggs so the whites and yolks are well incorporated in a bowl that is large enough to dip your eggplant slices. Next, pour your flour onto a plate. Lastly, place your breadcrumbs or panko onto a plate. If you are using regular bread crumbs or panko, season it with Italian seasoning and blend till well incorporated. Mix 1 part olive oil with 1 part vegetable oil, enough that your eggplant slices are covered and can slightly float in your pan, into a sauté pan. Olive oil imparts taste but the vegetable oil is what heats high enough to fry. Heat your oil on a medium-high heat. You can tell if your oil is hot enough by sprinkling a very, very, very, very small amount of water into the pan. If it crackles, then it is hot enough. Make sure you set up a plate with a paper towel for cooling the eggplant. Take each slice of eggplant and first cover it in flour. This allows the egg to adhere to the eggplant. Next, dip the slices in the eggplant and follow by dipping them into the bread crumbs. Make sure they are well covered and add them to the sauté pan. Do not over crowd the eggplant or they will steam without frying properly. It takes about two minutes on each side. The goal is fry the outside which in turn locks in heat that steams the inside. Once done and golden brown, remove them from the oil and place them on a paper towel covered plate to cool and drain. You can serve them with marinara, vodka sauce, or even ranch dressing. I personally like eating them as is but some people might find that too plain. Enjoy!